Susan Brooks is, and always has been, a service enthusiast! She began her multi-million dollar cookie gift and mail order company Cookies From Home literally from scratch, nearly 30 years ago. As the Corporate Cookie Queen, Brooks is in good company with Famous Amos and Mrs. Fields. She recently sold Cookies from Home to focus full time on her Service Enthusiasm, Leadership, and Intuitive Mastery series. Although she is a sales and marketing guru, Brooks is best known as a die-hard Service Enthusiast, where she can ‘raise the bar’ of service excellence in your company… and in your world. Susan’s passion for service has been a major part of her success, dating all the way back to her first career in the classroom, where her earliest “customers” were her high school English students. Teaching seven years and having a Master’s degree in education, Brooks created an inspiring curriculum that motivated and challenged her students. Today, she taps into these same talents and skills as she brings her high energy and insights into companies, organizations and associations that want – and need – to raise the bar on their customer service consciousness. As an international speaker, columnist, and trainer, Susan Brooks shares her Service Enthusiasm® principles and challenges with her audiences to renew their spirit and better serve both their external and internal customers. She customizes every presentation to focus on the client’s specific needs and objectives, and energizes her audiences with interactive programs so they can have fun while they learn. Information and inspiration are her specialties. When was the last time you looked “under the hood” of your company? When was the last time you did a reality check on delivering your company’s vision ? When was the last time you experienced A Fix That Lasts ? Seeing your organization through your customer’s eyes is critical! A mind-blowing level of service is what you need…and your customers deserve. Susan’s programs are designed to address BOTH sides of the service equation; customers as well as staff. Susan is like a mystery shopper on steroids! Bring her into your group, and experience the complete package: Evaluation, Analysis, Assessment and Implementation. As the CEO of a multi-million dollar company for 30 years, Susan knows exactly what to look for and how to boost your bottom line! Susan’s program will be your reality check! Secret Service Agent…. shhh If excellent Service is your organization’s top priority, The Secret Service Agent could be your reality check! The undercover agent will show you how you are serving your customers and how you can serve your customers. These programs will take your service over the top! Keynote: Using real-life tales of the best and worst practices in an industry specific presentation, service issues and opportunities present themselves, focusing a discussion that differentiates ordinary customer service from the outrageous and courageous Service Enthusiasm® experience. Service Enthusiasm principles and benefits are profound because they provoke thought and action that gets noticed, even to the simplest details. Current and relevant industry specific research and data will be integrated into this eye-opening program. Built upon this information and heightened awareness, each attendee will have the opportunity to identify where their company is on this spectrum…and what makes their company different from all the rest. This awareness initiates change. Ignorance is no longer bliss. It’s time to take action. Using interactive and experiential processes, the SSA delivers a body of information that can be transferred into usable, actionable strategies and solutions. Information and inspiration combine to ignite the desire and commitment to bring Service Enthusiasm into your company in a way that “moves the needle” on your company’s bottom-line! 1-Day Interactive Workshop: This on-sight workshop uses social media resources to receive anonymous input. A pre-workshop contest will stimulate excitement and friendly competition so attendees are revved up even before the winner is announced during the workshop. The participant with the most social media input will receive a complimentary review and report to serve their goals and objectives. This Secret Service Agent format is uniquely original, demonstrating the possibilities in bringing the Outrageous, Courageous, and Highly Contagious to this workshop. 3-Day Secret Service Agent program + Keynote: Building on and incorporating industry specific information, this customized program features an on-site Secret Service Agent experience that will then be integrated into a keynote presentation. The program focuses on an individual company’s profile and service performance, beginning with an initial interview with the company’s leaders in an effort to identify the vision and expectation of the customer’s experience. It is critical that the Secret Service Agent knows what has been identified as critically important to the company brand. Based on the number of site locations involved, the Secret Service Agent will then anonymously “shop” the actual in-the-field locations, participating in the customer experience first-hand. Each experience will be assessed, measured, and then integrated into an Executive Summary report. Specific challenges and opportunities will be identified, along with suggested solutions ready for immediate implementation. Once the priorities for change have been identified, along with the results of the assessment, this will be shared with the entire Team, recognizing the importance of every person’s contribution to deliver the vision for Service Enthusiasm. 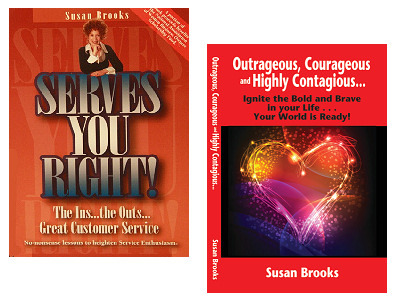 Author, CEO, Change Agent, Futurist, Provocateur, Global Servant, Storyteller Extraordinaire, Trailblazer… Susan is a living example of her second book: Outrageous, Courageous and Highly Contagious Leadership. 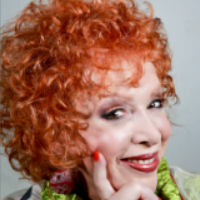 Susan Brooks is the founder and former CEO of a multi million-dollar retail and corporate gifting company. Headquartered in Arizona, Susan was at the helm of her growing organization while consistently called upon by other organizations to replicate the service driven culture she had created. This led Susan to publish her first book, Serves You Right!, a compilation of articles from her columns profiling outrageous accounts of when she either became a company’s statistical evidence of customer churn or was blown away from an over-the-top service experience. This became the basis for her consulting that evolved into advanced tools that measure the realities of customer acquisition investments against customer retention. The results were staggering and she knew it was her opportunity to get in the trenches with others and serve in a big way. This led her to sell the 30-year-old organization that she started from scratch in her kitchen and set out on an international campaign to raise the bar on Service Enthusiasm that proves an immediate impact on all stakeholders and their ROI. Susan now focuses on enhancing the global impact and unique ability to serve the internal and external customer while creating ingenious approaches to advance internal goals by leveraging existing assets internally and publically. Susan is a brave woman that takes no prisoners in doing all that is necessary through Outrageous, Courageous and Highly Contagious Leadership to support your organization in identifying and realizing its bottom-line potential. • PERSONALLY take her expertise and go undercover to engage employees and stakeholders at all levels and anywhere in the world to gain the truth in what your customer and client is experiencing in real-time. • Uncover and analyze the gaps in leadership’s perception vs. the customer’s reality. • Determine if the frontline is congruent to the organization’s mission, vision, and goals. • Deliver results to leadership that identifies an implementation plan to increase frontline enthusiasm, performance, customer retention, upsell conversions and new customer acquisitions. • Information is key…knowledge is power. • Leveraging Susan as your Secret Service Agent through the lens of a strategist, leader, and culture provocateur will confront and resolve the challenges that must first begin with a heighten awareness. • This is a significant opportunity to gain the information necessary to recognize customer’s touch-points in order to deliver the promise of your brand. • Winning companies and individuals were highlighted in the presentation and given awards specific to their accomplishments. • Challenges were isolated and addressed in practical formats, at both the national and street levels. • Strategic goals were created and aligned with the best interest of the national economy, business owners, employees and customers. • Island-wide customized training programs were then developed around these results to directly address the ‘customer experience’ at the street level.